Who wants some tacos??? As the seasons start to change, it is time to get that fire cooking grill out and cook something different. We have all see steaks cooked right on the coals! I even have an article on how to do that. 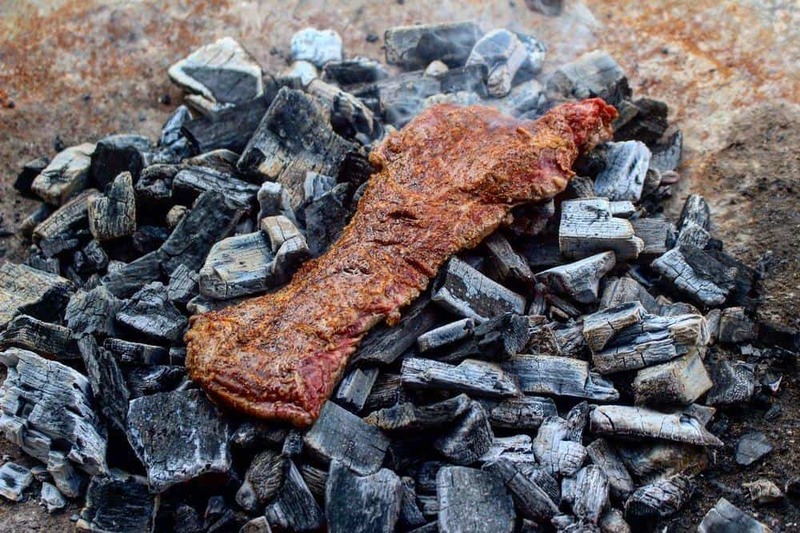 But, what about cooking a steak on the coals for tacos? Introducing my new Dirty Skirt Steak Tacos recipe! Forget just any old tacos, these bad boys are full of spice and flare cooked right on the coals for that added smoky flavor. Top them off with some radishes, onions, cilantro and lime to bring the full profile. Make these guys anywhere as long as you have a hot bed of charcoal and some corn tortillas! RELATED ARTICLE: Try some Grilled Shrimp Tacos! Cooking on the coals is no joke. You have to be hyper aware of everything that is going on or else your food might turn into coals. That is a prominent these with these Dirty Skirt Steak Tacos. First off, I make sure that I am using high quality natural hardwood lump charcoal like Cowboy Charcoal. This is give you peace of mind that you do not have any unnatural chemicals being cooked into your food. Avoid briquettes at all costs for this recipe. Next, you should make sure that you have a great piece of skirt, that it is trimmed and that it is thin. Making sure it is thin will really help no overcharring these Dirty Tacos. 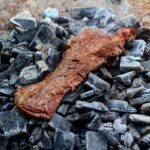 Finally, be okay with letting the steak sit on the coals. Letting it cook with give you the crust that you want! If you flip it back a forth, then you risk creating a dusty texture all over your meat. Skirt steak tacos made right on the coals topped with limes, cilantro, and other delicious ingredients. Use some Cowboy Hardwood Lump Charcoal to light fire and let burn for 10-15 minutes. Once charcoal is white hot, push into one flat pile for direct grilling. When at room temperature, lather the skirt steak with olive oil then season both sides thoroughly with sea salt, black pepper, chili powder & cayenne powder. Squeeze one half of the lime on both sides of the steak after seasoning. Place the steak directly on the coals for 2 minutes per side for medium-rare. For a medium steak then cook 3 minutes per side. Slice skirt steak against the grain with a slight angle (see video above). Place inside a warm corn tortilla with some diced onion, sliced radishes, cilantro and lime juice. Equipment Needed: Cowboy Charcoal, tongs, knife, and a cutting board.